A city in Tunisia, Tozeur has a little less than 70,000 inhabitants. 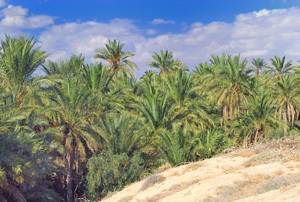 It looks like an oasis in the Sahara desert, surrounded by a vast palm grove. It unsurprisingly experiences a desert climate, hot and dry, with cool nights and even gets cold in winter. Its history dates back to prehistoric times, and there are traces of Roman occupation. The city has long been a major trade hub. You can visit the labyrinthine alleyways of the medina with its clay brick houses, also the Dar Cheraït museum and the zoo with its desert animals including snakes, fennec foxes, gazelles, camels and scorpions. A golf course has been created to enhance the tourist appeal offered by the range of hotel facilities, well developed since the 90s, and an international airport. Tozeur is the starting point for many excursions into the Great Tunisian South, especially to Nafta with its columns, or towards the Chott El Jerid with its mirages, or to the Matmata region which featured in the filming of Star Wars. A number of restaurants offer excellent Tunisian cuisine.